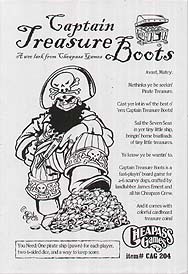 Captain Treasure Boots is the meanest, toughest, grouchiest pirate to ever sail the Seven Seas. And he is secretly one of you: whichever player brings home the most treasure in the shortest time! Captain Treasure Boots is a simple, fast-paced board game about sailing the seas, collecting buried treasure, and cashing it in for points. Of course, there's also plenty of sailing, drinking, and shooting. It wouldn't be a pirate game without that. And it comes with colourful cardboard treasure coins!